MY WORLD stops each time I see The Madame, former First lady Imelda Romualdez Marcos. Now an octogenarian, she looks as graceful and godly as ever. In a land as benighted as ours, she is the closest thing to a queen. Every time we cross paths, I am, for want of a better term, starstruck, for no Filipino has ever captured the world’s imagination more than The Madame has, no matter if critics consider her life as debatable as her riches. I am convinced that, driven by the Second District Representative-elect’s mantra of pursuing only “the true, the good, and the beautiful,” wonderful things are on their way, and these we gladly await. But why does she even have to be in politics at this time of her life? Her rightful place in Philippine, er, world history is secure. Why the trouble? 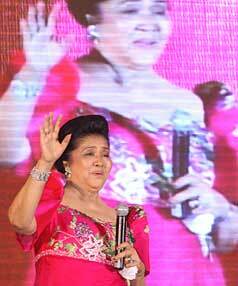 “I just want to be a good grandmother to Ilocos and to the nation,” she said in a speech. Allow me to share with you, dear friends, various quotes attributed to The Madame. I have personally listened to her deliver many of these lines while some are from primary sources. These statements occasionally run on my head without cease. They call it LSS, Last Speech Syndrome. JOURNALIST TELLS the truth. Powers-that-be get furious. Powers-that-be hire assassins. Journalist is murdered. Public outrage follows. One hopes, dear karikna, that the sequence is always as simple when a member of the media falls, but, sadly, there are complications. One is tempted to say that media is to be blamed, too, for making the Philippines one of the top three most dangerous countries for journalists in the world (along with Iraq and Somalia), and Ilocos Norte a killing field for members of the Fourth Estate. Corruption, impropriety, and unprofessional behavior cloud the practice of journalism here and in other parts. Ergo, the death of a journalist is not always an attack against the truth. It could also be a screaming statement against lies, spins, and half-truths, which are even more dangerous than lies. A media worker wields tremendous power, which, if used irresponsibly, could backfire, and with fatal results. There is no justifying though the ruthless killings of journalists which, from 1986, now number 137, 104 of which transpired under the Arroyo regime. Not even the shadiest journalist deserves to be at the mercy of an assassin. We have very strong libel laws to punish a malicious blabbermouth, and to redeem the dignity of an aggravated fellow. In a supposedly civilized, democratic society such as ours, there is just no room for motorcycle-riding, gun-firing cowards.